North Carolina is a state on the rise. The Tar Heel State’s economy is experiencing steady growth thanks to a diverse range of industries including technology, tourism, and manufacturing. Everyone needs healthcare, and with its four medical schools and six research hospitals, North Carolina is in a good position to address those needs. Cities on the West Coast and East Coast are struggling to create enough affordable housing for its residents, but that’s not as big of an issue in North Carolina, as it has a lower-than-average-cost of living compared to the rest of the country. Before we take a deep dive into North Carolina, let’s divide the state up into three parts: the coastal eastern region, the Piedmont central region, and the mountainous western region. Beaches are always a good tourist draw, and coastal North Carolina offers 300 miles of barrier islands to shake up your everyday routine. Major cities in this part of the state include Greenville, Wilmington, and Jacksonville. Greenville is arguably the educational center of the region. It is home to Eastern Carolina University, one of the largest institutions of higher learning in North Carolina. Wilmington is home to picturesque beaches and the occasional TV or movie production. In fact, North Carolina is sometimes referred to as the “Hollywood of the East” due to its strong showbiz history. If you start in Wilmington and head north for an hour, you’ll find yourself in Jacksonville, a city of about 70,000 people often associated with the Camp LeJeune Marine Corps base. It may help to know that “Piedmont” is French for “foothill.” If you can picture that, then you’ve probably got a fairly accurate mental picture of Central North Carolina’s trademark rolling hills. Of course, picturing it isn’t the same as seeing it for yourself. If you want to be where all the people are, then you’ll really appreciate this part of the state, as the state’s biggest cities are in the middle portion of North Carolina. The largest city is Charlotte with an estimated population of over 850,000. 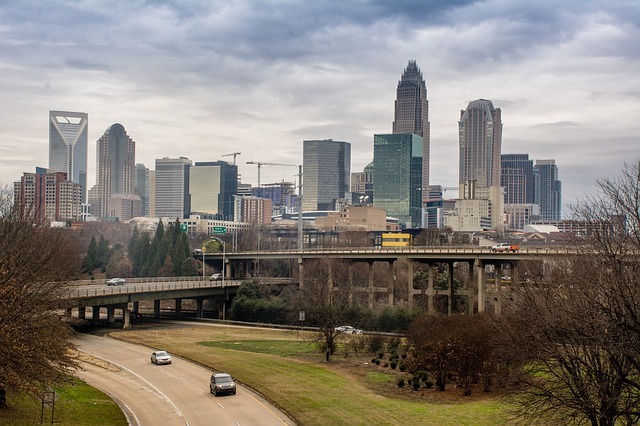 Also known as Queen City, Charlotte is a major financial services hub that’s home to the world headquarters of Bank of America and the East Coast operations center for Wells Fargo. That makes it an attractive place for young professionals to settle. Young people also flock to the cities of Raleigh, Durham, and Chapel Hill. Collectively, these three cities and their three associated universities are part of an area known as The Research Triangle. North Carolina State University, Duke University, and the University of North Carolina at Chapel Hill are each accomplished universities in their own right, but they’re an even more significant source of collective brainpower since they all exist in the same region. Apple has been looking at the possibility of building a new headquarters in Research Triangle Park. Even if Apple doesn’t end up there, expect the area’s young, educated populace to continue using sleek, modern products like the iPhone. In fact, if you’re in the area and looking to upgrade your phone, you’ll be able to find plenty of cell phone stores in North Carolina. The Eastern portion of the Tar Heel State is home to the Blue Ridge and Smoky Mountains. If you’re looking for the country’s highest point east of the Mississippi River, you’ll find it here by visiting Mount Mitchell. As far as cities go, Asheville has developed a reputation for being quirky and artistic. Come for the historic architecture, but stay for the great food and drink scene. When you’re in this town of about 90,000, you don’t have to pick between good food and good beer, as there’s enough of both to go around. Asheville is also known for both its progressive politics and rapid gentrification. Regardless of where you fall on the political spectrum, Asheville is a distinctive part of the North Carolina experience.